Success! Kabamu from Uganda raised $249 for hernia repair surgery. Kabamu's treatment was fully funded on November 1, 2016. 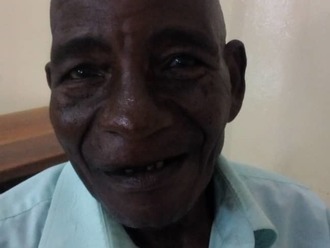 Kabamu successfully received hernia repair surgery. Kabamu is doing great and his surgery was a success. He is currently at home resting with his family, and already feeling so much better. He has shared that he feels much less pain now and is more calm and peaceful. Now that his hernia has been repaired, he is no longer at risk of intestinal incarceration, obstruction, or strangulation. Kabamu is a 34 year old farmer from Uganda, who specializes in cultivating maize on a small scale. He has five children that are in school and live with their mother. In addition to farming, he owns a business that allows him to support the education of his children. He went to school up to Primary Five, but had to drop out due to lack of school fees. Seven years ago, Kabamu started feeling pain in his right inguinal area, and later swelling developed in the same area. Pain worsens when he walks and when he lifts heavy items. He has never reported his condition to a hospital because of lack of money for his treatment. He uses herbs, but they give him a little relief. If left untreated, Kabamu may suffer many complications. Until now, Kabamu has not been able to receive treatment to repair his hernia. For $249, Kabamu will undergo hernia repair surgery at Holy Family Virika Hospital. “After surgery I hope to continue working in my gardens to get money and support my children,” Kabamu shared. Kabamu's case was submitted by Joan Kadagaya at African Mission Healthcare Foundation in Uganda. Kabamu was submitted by Joan Kadagaya, Curative Medical Support Program-Partner Representative at African Mission Healthcare Foundation, our medical partner in Uganda. Kabamu received treatment at Holy Family Virika Hospital. Medical partners often provide care to patients accepted by Watsi before those patients are fully funded, operating under the guarantee that the cost of care will be paid for by donors. Kabamu's profile was published to start raising funds. Kabamu's treatment was fully funded. Kabamu's treatment was successful. Read the update.